Policemen riding around on horses might be a little funny but Canadian laws are nothing to laugh at! Have you ever wanted to be noticed on your bicycle and wished you could just fix a siren onto your handlebars? Not so fast! If you're in Ontario that could lead to a 5,000 dollar fine. Want to pay for an item with your coin jar? If that item is over twenty-five dollars, clerks don't have to accept that! You can also forget building snowmen taller than three feet in Sauris, drive a Taxi in a t-shirt in Nova Scotia, and hooting and hollering in Petrolia, Ontario. With all this information, it's safe to say that Canadian mounties have a lot of laws to enforce! 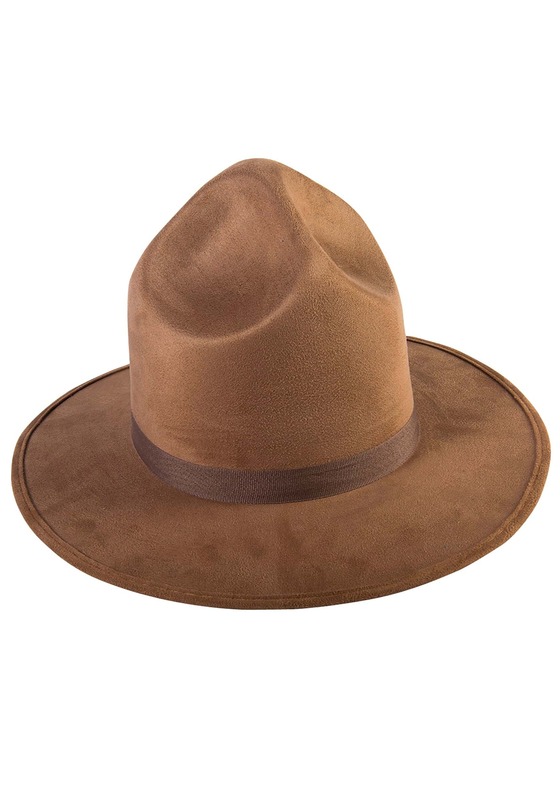 This tall mountie hat has a faux suede brown fabric. The top is brimmed with a flat brown fabric and also has two deep dents to make it easier to take off your hat when you modestly accept thanks for keeping the peace. Pair this hat with a bright red Mountie uniform and you'll look like you're ready to enforce Canadian law, no matter how weird those laws might be. Just remember to keep it polite, that's the Canadian way.